Cab Franc is back!! And the 2016 vintage has got it going on – by “it,” we mean serious flavor! 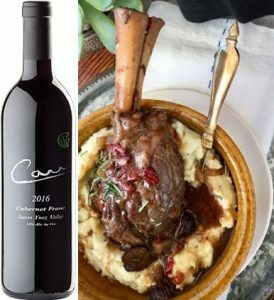 The 2016 Carr Cabernet Franc encompasses an overall sense of natural flavor components like roasted bell pepper with mellow notes of violet and herbs. 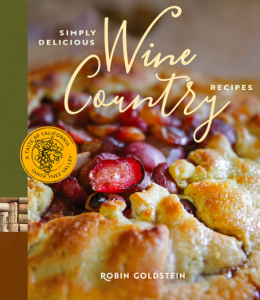 We have paired up with local Private Chef Robin Goldstein to bring you this incredible lamb shank recipe from her cookbook, Simply Delicious Wine Country Recipes. Like what you see? You can pick up a copy at either Carr location. Cheers! 1. Liberally sprinkle the lamb shanks all over with a mixture of salt and pepper, and dredge in the flour. Heat a large heavy sauce pot over medium-high heat, and brown the shanks in olive oil on all sides. Remove the shanks and set aside. 2. Sauté the sliced onion and garlic in the pan drippings until soft, about 5 minutes. Add the wines, broth, tomatoes, figs, and rosemary. Return the shanks to the pot and bring the liquid to a boil. Reduce the heat to low, cover and simmer for 1½ hours, or cook in a slow cooker for 4-6 hours. 3. Remove the shanks and boil the sauce for another 15 minutes or so, until it is reduced to a gravy-like consistency. Taste and adjust the seasoning of the sauce with ½ tsp. of sea salt and a few grinds of pepper. Put the shanks back in the thickened sauce to heat through until ready to eat. 4. Serve with fluffy mashed potatoes or buttered egg noodles to sop up all the juices.